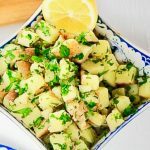 A favorite family recipe for vegan lemon parsley potatoes is an herbaceous, lemony, garlicky and comforting side dish. 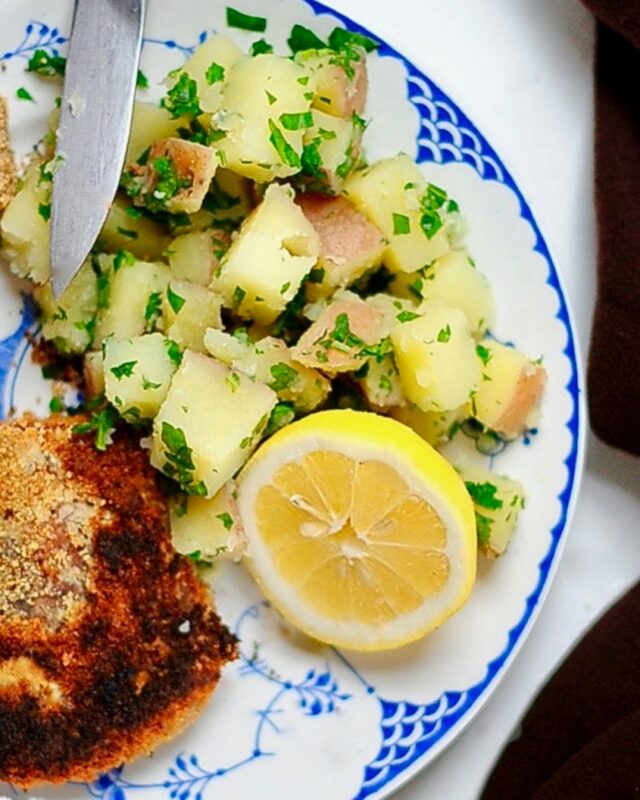 Serve these at your next picnic or on Octoberfest with my Seitan Schnitzel for a German-inspired feast! My son’s tiny round hand digging beneath the earth and pulling out a handful of dirt crusted new potatoes. The spray of the hose and his giggles as we wash them together and run to the kitchen. My aunt popping a teensy new potato into my waiting mouth as I sit on her steamy kitchen counter watching her cook. The burst of red skin, the sweet soft interior. The trick with potatoes is to dress them while they are still hot. I learned that trick from my Aunty Helle in Denmark. They will soak that marinade right up and still retain their moist fluffy interiors. She was the potato whisperer. 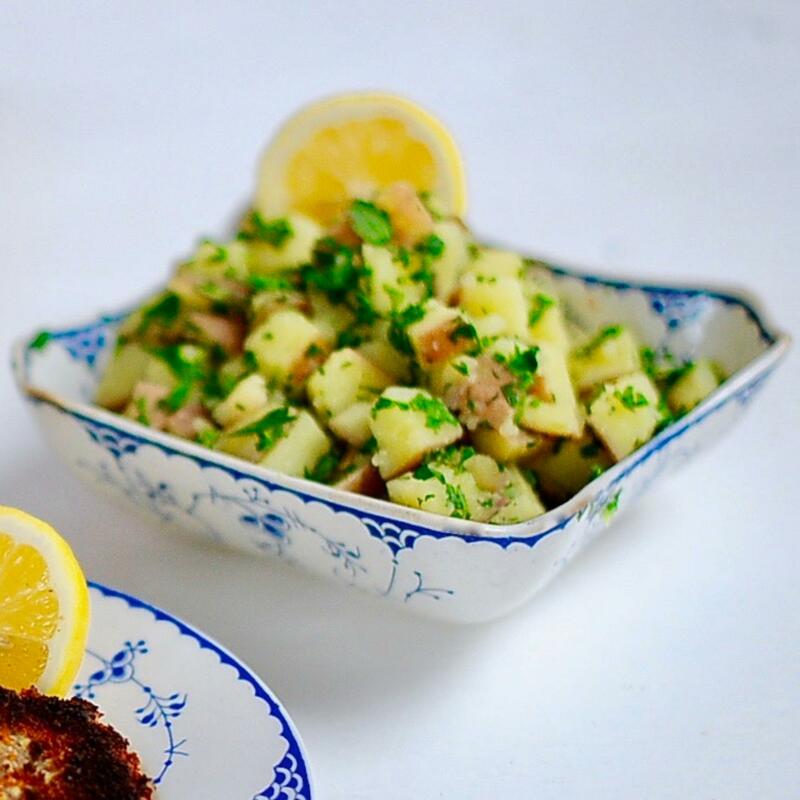 I don’t believe I ever ate a dinner at her long wooden table that didn’t have a platter of potatoes: scalloped (Flødekartofler), brown butter caramelized potatoes (Brunede Kartofler), sour cream drenched potato salad (Kold Kartoffelsalat), a pile of plain boiled potatoes, or these vegan lemon parsley potatoes. The main difference between hers and mine is I’ve upped the garlic and changed out the rapeseed oil for olive oil. 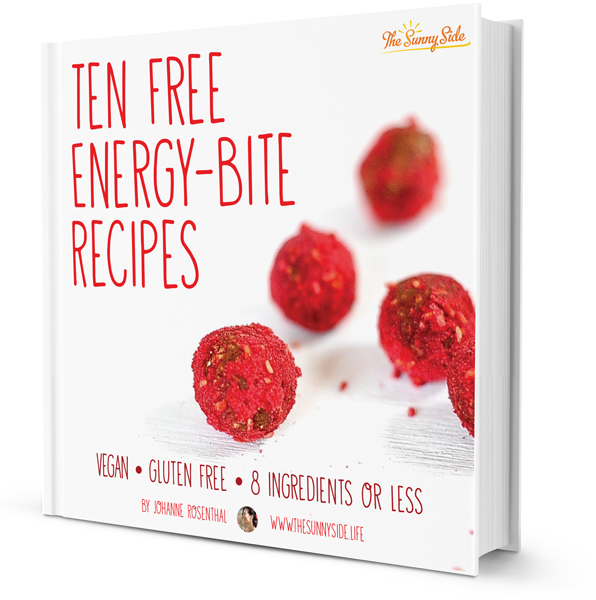 Use any oil you love and you can’t go wrong. Dress potatoes while they are hot! The smaller you cut them the faster they cook and the more uniform the texture. Remove potatoes from the heat when just barely fork tender as they will keep cooking for a few minutes. You can place a kitchen towel over the potatoes and they will steam a little longer. Use the right potato for the job. Buy your potatoes with dirt still attached if possible and only wash them just before cooking. You’ll be amazed at how moist they are. 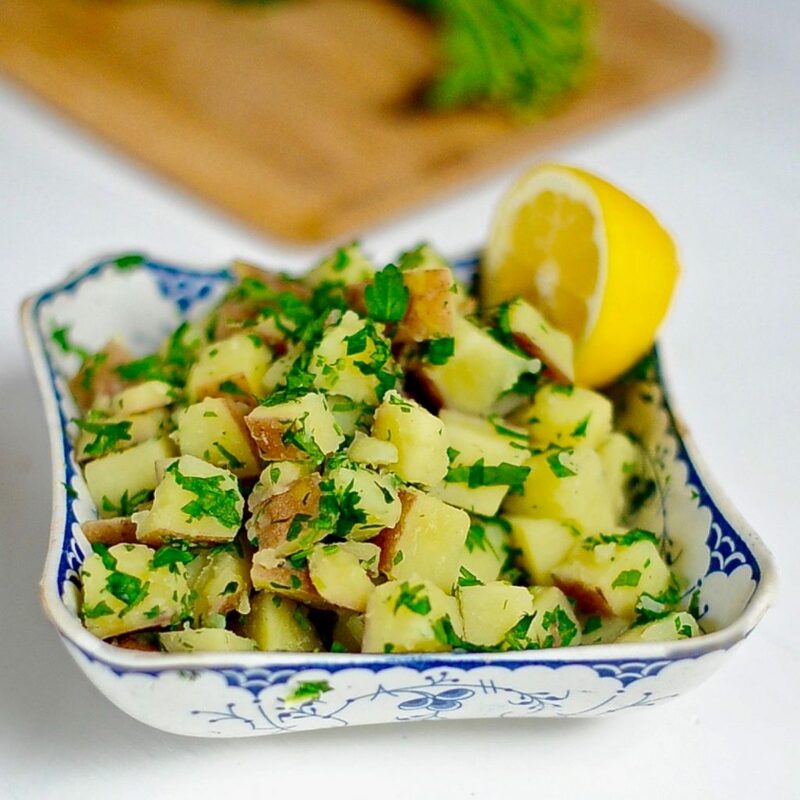 Vegan Lemon Parsley Potatoes are a wonderful dish to bring to your next potluck as they work equally well hot or cold. There was never a meal at Aunt Helle’s house that didn’t include potatoes, except for the time I rashly made a spaghetti dinner for her and Uncle Torben. (That didn’t go down too well.) I love boiled potatoes but I struggle not to over- or undercook them. I can’t seem to get it right. I’ll follow your timing advice from now on.